I’ve come to loathe email. After a few days of holiday neglect, a growing sense of duty weighs on me. It’s always there, waiting, breeding in my inbox. The relentless onslaught of email creates the sense of being buried alive in a barrage of electronic messages — some with valuable information and some totally without. Keeping on top of the review and sorting process to reach the holy grail of inbox zero can take hours out of a daily routine. I didn’t always feel this way. In the late 70’s, email was an empowering tool to coordinate holidays and vacation travel with my extended family. In the 80’s, friends began to join us online and I could suggest exchanging files with a few progressive clients. During the 90’s email access and use became ubiquitous, but it wasn’t until this past dismal decade that the time-cost versus reward-benefit analysis tipped to become burdensome. 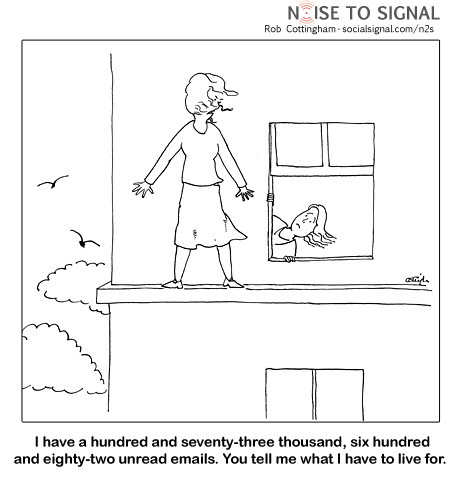 Harvard Business School Tips for Mastering Email Overload. 99 Email Security and Productivity Tips.